With those opening remarks a couple weeks ago, winemaker John Alban pretty much summed up the fun-loving spirit of Hospice du Rhône, the annual wine event celebrating syrah and her many sisters that’s been going down up in Paso Robles since 1991. He was referring to the pair of shoes he was holding in his hand, refugees from the previous night’s Rhône ’n’ Bowl event at Paso Bowl, where winemakers from France, California, Australia, and elsewhere had battled it out with balls and pins amid a swirl of fine food and finer wine. From Côte-Rôties and crispy-fresh viogniers to Kobe beef corn dogs and chicken-Parmesan-on-a-stick, the bowling was a tasty affair, and pretty mild, too, even with karaoke going strong ’til about 9:30 p.m. — although the collective hair got let down later at Villa Creek Restaurant just off the square in downtown Paso, where many switched from vino to liquor and the chatting was reminiscent of a high school reunion. The Friday morning comments got some chuckles during what must have been an early morning for many of the attendees, but soon we were switching to the serious side of the weekend: the panels, upon which sat experts from around the world to discuss the trends of the day. The first panel, called “Rhône Valley Wines” and featuring French winemakers Michel Gassier (Château de Nages), Nicolas Haeni (Domaine de Cabasse), and Alberic Mazoyer (Domaine Alain Voge), proved a perfect introduction to the whole affair, but it was also quite a coup for the event. Alban explained that when he started the event 19 years ago, he never imagined that anyone from the “inner Rhône” would ever participate, which was the humble way to say that Hospice du Rhône —and the wines of California — have come quite a long way in just two decades. The Rhône Valley, we learned, is 150 miles long by 30 miles wide, consists of 182,500 acres, and is France’s second biggest wine-producing region, which ushered in the first of many digs at Bordeaux, France’s top wine hub. There are 6,000 vineyard owners whose grapes are used by 1,550 wineries to produce more than 400 million bottles in 2010 alone; of that, 80 percent is red and 30 percent is exported to 155 countries, with the United Kingdom the top importer and the United States quickly trying to take that position, its Rhône desires growing 22 percent from 2009 to 2010. 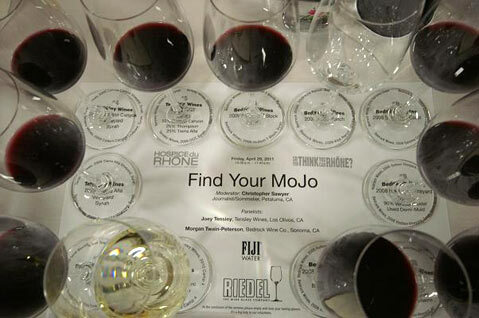 Red wines from the northern Rhône must only be syrah, and wines from the southern Rhône are dominated by grenache, although mourvèdre, cinsault, carignan, and syrah may also be blended. The dominant whites are viognier, marsanne, and roussanne, although grenache blanc seems to be gaining steam. The most heralded wines come from one of the 18 crus in the Rhône, and below that top designation, there are 17 Côte du Rhône “named villages,” where wines from those regions must bear the name of the village as a sign of higher quality. Like a soccer league, villages may sneak into the named category as their qualities rise, and underperforming villages may fall out, too. Nicolas Haeni also has environmental concerns on his mind, and showed some slides of a terracing project at his Cabasse vineyards. Employing a technology only used so far in the Priorat region of Spain, Haeni explained that the method is very gentle on the soil, lends itself to more homogenous terroir, and fights against erosion. It’s just one of many experiments that he’s happy to rile up his more traditional father with, such as when he made one barrel of syrah with 100 percent stems, and everyone liked it. Whatever the case, his Domaine de Cabasse 2007 Côtes du Rhône Villages Séguret Cuvée Garnacho (its grenache base offset with syrah, carignan, and counoise) offered a subtle truffle or mushroom flavor, and was my favorite of the morning bunch. The morning’s second panel featured Santa Barbara County’s score-bagging superstar Joey Tensley of Tensley Wines and equally respected Morgan Twain-Peterson of Bedrock Wine Co. in Sonoma, with deft and insightful moderation by sommelier and writer Christopher Sawyer. As the trio chatted, the crowd was led through 10 distinct and hard-to-find wines, a true treat for anyone interested in syrah. The day’s lunch was a rosé-soaked affair sponsored by Tavel, the region of the Rhône where the dry pink wine is king, and catered by Full of Life in Los Alamos (the flatbread people). Alone for the weekend, I jumped onto a table that turned out to have a wine store owner from Chicago, a salesman from Tablas Creek, an independently wealthy guy from Los Osos who hobbies in the wine biz, and two winemakers: Ryan Render of Rendarrio Vineyards in Paso and Shawn Shai Halahmy, of Shai Cellar in Buellton. Next up was the afternoon tasting, where 86 Rhône winemakers from California, France, Chile, Spain, South Africa, and Australia offered nearly 400 different wines. Because they are hard to taste elsewhere, the French wines were certainly a hit, though I also enjoyed trying some of the more interesting offerings, too, such as the Humboldt County wines from Cabot Vineyards, located in Orleans in far Northern California. But I soon retreated to my rented room atop the Pine Street Saloon in downtown Paso for a nap, as I had a dinner of expensively epic proportions on tap at Bistro Laurent. That’s the French restaurant just off the square where I met Dave Yates and Matt Brady of Jaffurs Wine Cellars to chow down on serious grub with true Rhône wines to wash it all down. It wasn’t cheap, but it was once-in-a-lifetime stuff: frog legs and other apps, served with a white Château des Tours; wild greens and sautéed sea scallop salad with a Georges Vernay Condrieu “Terrasses De Empire” 2009; crispy tart with duck confit, local goat cheese, and caramelized onions with a 2006 Château Rayas white from Châteauneuf-du-Pape; a king salmon and braised lentils with two offerings, the 2009 Féraud-Brunel Châteauneuf-du-Pape and, perhaps the unanimous star of the night, a 2006 red from Château Rayas; and, if that wasn’t enough, a ragout of venison with morels served with a Bernard Burgaud Côte-Rôtie 2007. The next day, I was happy to sleep in and drive back to Santa Barbara for a wine-free Saturday as the rest of the Hospice du Rhône carried forth. I’d had a perfect first taste of this world-class event, and I certainly didn’t want be the next attendee to evaporate. 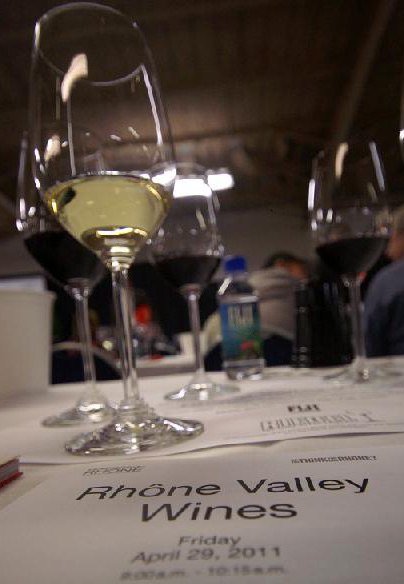 Tickets for the 20th annual Hospice du Rhône event in April 2012 go on sale in November 2011. For more info, see hospicedurhone.org.